The goal of this game is to discover opportunities to transform an existing, linear process into a more valuable and growing process by taking a different viewpoint. This is useful in examining processes that are deemed “worth repeating,” such as the customer experience. It might be a good time to play through this exercise if the current process is transactional,compartmentalized, or wasteful. Other indications are a group that is “navel gazing” and focused primarily on its internal process, or when there is a sense that after the process is complete, no one knows what happens next. You will need a high-level understanding or documentation of the current state of things. Any existing, linear process will work. Introduce the exercise by “black boxing” the current process. This means that during the course of the exercise the group’s focus will be on what’s outside the process,not the fine detail of what’s going on inside the box. 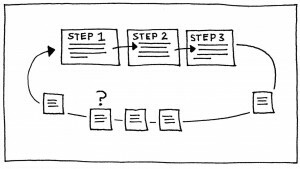 To make this visual, give each step in the process a box on the wall (medium-sized sticky notes work well) and connect them with arrows in a linear fashion. To start the exercise, ask the group to think about, to the best of their knowledge, what happens before the process: Who or what is involved? What is going on? Repeat this for the end of the process: What comes after the process? What are the possible outcomes? You may ask them to capture their thoughts on sticky notes and post them before and after the process. The group is ready to explore possibilities and opportunities. Again, sticky notes work well for capturing ideas. Have the players capture their thoughts along the line and discuss. Summarize or close the exercise by generating a list of questions and areas to explore. This may include looking at the internal, defined process for improvement ideas. 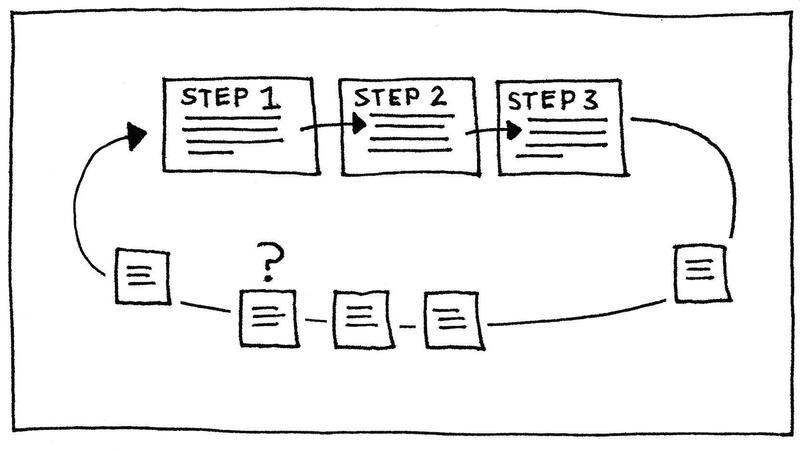 Pick the right process to do this with. A process that warrants repeating, such as the customer experience, works well. Knowledge creation and capture, as well as strategic planning, are also candidates. Get the right people in the room. Some awareness of what happens outside the process is needed, but can also hamper the experience. One of the biggest potential outcomes is a visceral change in perspective on the participants’ part: from internal focus to external focus. This game is credited to James Macanufo.